The Dueling Loops is short for The Dueling Loops of the Political Powerplace simulation model. This model forms the core of Thwink.org's analysis of the sustainability problem. The basic model is shown below. It's called the Dueling Loops because the two main loops are locked in a duel over the same pool of Uncommitted Supporters. Whoever convinces the most Uncommitted Supporters to support them wins. The Dueling Loops model is a fundamental structure that appears to lie at the very heart of why political systems resist change that would benefit the common good. It explains critically important behaviors like why there's so much change resistance to solving problems like sustainability and why political corruption is so endemic. Once you understand the Dueling Loops your view of the sustainability problem will change radically. Its root causes will be obvious. That opens the door to solutions that will work because they resolve root causes instead of intermediate causes. Over time, political system evolution has whittled the top two strategies for gaining supporters into just two basic strategies. In the Race to the Top, politicians compete for supporters on the basis of the truth about what they can do to optimize the common good of all, which is the goal of democracy. In the Race to the Bottom, politicians compete to see who can help special interests the most. Since this reduces the good of the majority, it will not produce a winning majority unless deception and favoritism is used to get people to vote against their own best interests. (Of the two, deception is used far more because it's cheaper.) For example, a degenerate politician will promise a special interest group something but once in office will do a lot less than promised. Or a degenerate politician will create a false enemy and rally his supporters against it, such as the fallacy that big government is bad, immigrants are stealing your jobs, or gays are taking over. 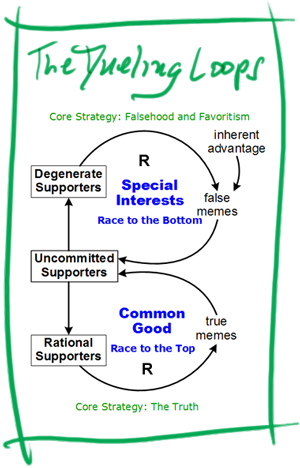 The key insight in the Dueling Loops model is that the Race to the Bottom has an inherent advantage over the Race to the Top, because people's ability to detect political deception is less than perfect. In fact, it's abysmally low. So low, that the right deception (false memes on the model) works like a charm most of the time. Thus when degenerate and rational politicians compete (duel) for the same pool of Uncommitted Supporters, the Race to the Bottom wins most of the time. The ramifications of this are profound. The most powerful special interest group in most industrialized countries is the New Dominant Life Form, better known as large for-profit corporations. Their top goal is to maximize short term profits. Solving the sustainability problem conflicts with that goal, so Corporatis profitis is dead set against solving the problem. By exploiting the inherent advantage of The Race to the Bottom the corporate life form has been able to stall, water down, roll back, and in general successfully oppose all major attempts to solve the sustainability problem. Isn't that what you would do if you were not a person, but instead were a member of the army of the New Dominant Life Form? This glossary entry offers only a brief introduction to the Dueling Loops. For a little more see system dynamics, which introduces the model in more detail. For the full story, see The Dueling Loops paper. For how the Dueling Loops were used as the core model to analyze the sustainability problem, see the Common Property Rights book. Why is political corruption so impossibly hard to stamp out? Because it's the winning strategy most of the time. In theory politicians should tell the truth and strive to serve the people. But in practice if a politician did that, they would on the average lose out to other politicians who told lies and thereby gained more supporters. This causes even the most honest politician to bend to the will of the system, and to become a little corrupt, and then a little more so, until he is indistinguishable from the herd. Why does campaign finance reform fail again and again? Because it reduces the ability of degenerate politicians to exploit The Race to the Bottom. Most politicians are dependent on donations from special interests, so those politicians will see to it that campaign finance reform is either so weak it's ineffective or block it altogether. Why is income inequality on the rise in most industrialized nations? Because the chief ally of the New Dominant Life Form is its owners, the rich. Degenerate politicians see to it that both groups get big breaks, like thousands of tax loops holes, various favorable bills, and countless legislative earmarks. The cumulative result is the rules of the game are changed to favor the rich at the expense of everyone else. Except corporations. Many more behaviors could be listed. The biggest is explained on the left. The Dueling Loops explain why there is such strong successful resistance to solving the sustainability problem. Are you as concerned as we are about the rise of populust authoritarians like Donald Trump? Have you noticed that democracy is unable to solve important problems like climate change, war, and poverty? If so this film series is for you! Why is democracy in crisis? 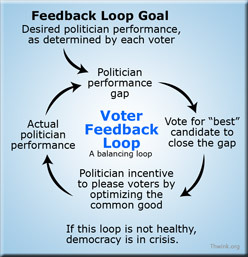 One intermediate cause is a weakened Voter Feedback Loop. Powerful root cause forces are working to weaken the loop. These average 9 minutes. They give a quick introduction to the Dueling Loops model and how it explains the tremendous change resistance to solving the sustainability problem. The most eye-opening article on the site since it was written in December 2005. More people have contacted us about this easy to read paper and the related Dueling Loops videos than anything else on the site. Do you every wonder why the sustainability problem is so impossibly hard to solve? It's because of the phenomenon of change resistance. The system itself, and not just individual social agents, is strongly resisting change. Why this is so, its root causes, and several potential solutions are presented. The most astonishing short read (7 pages) on the site, if you've never heard about it. The memo was written in 1971.
a higher level of thinking. The Common Property Rights Project - This is where our main effort is today. Analysis is the breaking down of a problem into smaller easier to solve problems. Exactly how this is done determines the strength of your analysis. You will see powerful techniques used in this analysis that are missing from what mainstream environmentalism has tried. This explains why a different outcome can be expected. The key techniques are proper subproblem decomposition and root cause analysis. Click on the table for the full table and a high level discussion of analysis results. This is the solution causal chain present in all problems. Popular approaches to solving the sustainability problem see only what's obvious: the black arrows. This leads to using superficial solutions to push on low leverage points to resolve intermediate causes. Popular solutions are superficial because they fail to see into the fundamental layer, where the complete causal chain runs to root causes. It's an easy trap to fall into because it intuitively seems that popular solutions like renewable energy and strong regulations should solve the sustainability problem. But they can't, because they don't resolve the root causes. In the analytical approach, root cause analysis penetrates the fundamental layer to find the well hidden red arrow. Further analysis finds the blue arrow. Fundamental solution elements are then developed to create the green arrow which solves the problem. For more see Causal Chain in the glossary. First the analysis divided the sustainability problem into four subproblems. Then each subproblem was individually analyzed. For an overview see The Four Subproblems of the Sustainability Problem. This is no different from what the ancient Romans did. It’s a strategy of divide and conquer. Subproblems like these are several orders of magnitude easier to solve because you are no longer trying (in vain) to solve them simultaneously without realizing it. This strategy has changed millions of other problems from insolvable to solvable, so it should work here too. For example, multiplying 222 times 222 in your head is for most of us impossible. But doing it on paper, decomposing the problem into nine cases of 2 times 2 and then adding up the results, changes the problem from insolvable to solvable. Change resistance is the tendency for a system to resist change even when a surprisingly large amount of force is applied. Overcoming change resistance is the crux of the problem, because if the system is resisting change then none of the other subproblems are solvable. Therefore this subproblem must be solved first. Until it is solved, effort to solve the other three subproblems is largely wasted effort. The root cause of successful change resistance appears to be effective deception in the political powerplace. Too many voters and politicians are being deceived into thinking sustainability is a low priority and need not be solved now. The high leverage point for resolving the root cause is to raise general ability to detect political deception. We need to inoculate people against deceptive false memes because once people are infected by falsehoods, it’s very hard to change their minds to see the truth. Life form improper coupling occurs when two social life forms are not working together in harmony. In the sustainability problem, large for-profit corporations are not cooperating smoothly with people. Instead, too many corporations are dominating political decision making to their own advantage, as shown by their strenuous opposition to solving the environmental sustainability problem. The root cause appears to be mutually exclusive goals. The goal of the corporate life form is maximization of profits, while the goal of the human life form is optimization of quality of life, for those living and their descendents. These two goals cannot be both achieved in the same system. One side will win and the other side will lose. Guess which side is losing? The high leverage point for resolving the root cause follows easily. If the root cause is corporations have the wrong goal, then the high leverage point is to reengineer the modern corporation to have the right goal. Solution model drift occurs when a problem evolves and its solution model doesn’t keep up. The model “drifts” away from what’s needed to keep the problem solved. The world’s solution model for solving important problems like sustainability, recurring wars, recurring recessions, excessive economic inequality, and institutional poverty has drifted so far it’s unable to solve the problem. The root cause appears to be low quality of governmental political decisions. Various steps in the decision making process are not working properly, resulting in inability to proactively solve many difficult problems. This indicates low decision making process maturity. The high leverage point for resolving the root cause is to raise the maturity of the political decision making process. In the environmental proper coupling subproblem the world’s economic system is improperly coupled to the environment. Environmental impact from economic system growth has exceeded the capacity of the environment to recycle that impact. This subproblem is what the world sees as the problem to solve. The analysis shows that to be a false assumption, however. The change resistance subproblem must be solved first. The root cause appears to be high transaction costs for managing common property (like the air we breath). This means that presently there is no way to manage common property efficiently enough to do it sustainably. The high leverage point for resolving the root cause is to allow new types of social agents (such as new types of corporations) to appear, in order to radically lower transaction costs. There must be a reason popular solutions are not working. Given the principle that all problems arise from their root causes, the reason popular solutions are not working (after over 40 years of millions of people trying) is popular solutions do not resolve root causes. This is Thwink.org’s most fundamental insight. Click on the table for a high level discussion of the solution elements and to learn how you can hit the bullseye. The solutions you are about to see differ radically from popular solutions, because each resolves a specific root cause for a single subproblem. The right subproblems were found earlier in the analysis step, which decomposed the one big Gordian Knot of a problem into The Four Subproblems of the Sustainability Problem. Everything changes with a root cause resolution approach. You are no longer firing away at a target you can’t see. Once the analysis builds a model of the problem and finds the root causes and their high leverage points, solutions are developed to push on the leverage points. Because each solution is aimed at resolving a specific known root cause, you can't miss. You hit the bullseye every time. It's like shooting at a target ten feet away. The bullseye is the root cause. That's why Root Cause Analysis is so fantastically powerful. 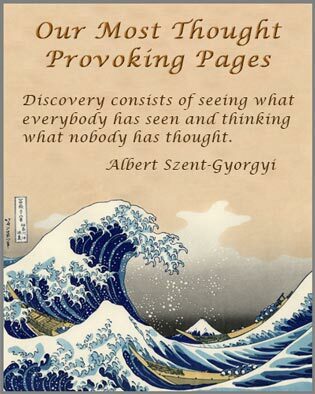 The high leverage point for overcoming change resistance is to raise general ability to detect political deception. We have to somehow make people truth literate so they can’t be fooled so easily by deceptive politicians. This will not be easy. Overcoming change resistance is the crux of the problem and must be solved first, so it takes nine solution elements to solve this subproblem. The first is the key to it all. In this subproblem the analysis found that two social life forms, large for-profit corporations and people, have conflicting goals. The high leverage point is correctness of goals for artificial life forms. Since the one causing the problem right now is Corporatis profitis, this means we have to reengineer the modern corporation to have the right goal. Corporations were never designed in a comprehensive manner to serve the people. They evolved. What we have today can be called Corporation 1.0. It serves itself. What we need instead is Corporation 2.0. This life form is designed to serve people rather than itself. Its new role will be that of a trusted servant whose goal is providing the goods and services needed to optimize quality of life for people in a sustainable manner. What’s drifted too far is the decision making model that governments use to decide what to do. It’s incapable of solving the sustainability problem. The high leverage point is to greatly improve the maturity of the political decision making process. Like Corporation 1.0, the process was never designed. It evolved. It’s thus not quite what we want. The solution works like this: Imagine what it would be like if politicians were rated on the quality of their decisions. They would start competing to see who could improve quality of life and the common good the most. That would lead to the most pleasant Race to the Top the world has ever seen. Presently the world’s economic system is improperly coupled to the environment. The high leverage point is allow new types of social agents to appear to radically reduce the cost of managing the sustainability problem. This can be done with non-profit stewardship corporations. Each steward would have the goal of sustainably managing some portion of the sustainability problem. Like the way corporations charge prices for their goods and services, stewards would charge fees for ecosystem service use. The income goes to solving the problem. Corporations gave us the Industrial Revolution. That revolution is incomplete until stewards give us the Sustainability Revolution. This summarizes the past ten years of research at Thwink.org. Twelve sample solution elements and the analysis behind them are presented. This analyzes the world’s standard political system and explains why it’s operating for the benefit of special interests instead of the common good. Several sample solutions are presented to help get you thwinking. What Is an Analytical Approach? It's best to start with the first one and watch them all in sequence. Note how generic most of the tools/concepts are. They apply to far more than the sustainability problem. Thus the glossary is really The Problem Solver's Guide to Difficult Social System Problems, using the sustainability problem as a running example. The glossary is the foundation for the entire website. It defines the conceptual framework required to "move toward higher levels" of thinking. What Does Thwink Have to Offer? One way to get started is The Common Property Rights Project. This can be done by switching to Root Cause Analysis, which will lead to Environmentalism 2.0.